I made my first pilgrimage to this newly established monastery in the Serbian Orthodox Archdiocese on September 26-29, and felt very much at home in the beautiful and peaceful natural surroundings, and in their healthy balance of prayer, work, stillness, and quiet fellowship. The entrance to the Skete, with a greenhouse right by the driveway. Founded in 2014 in the rural countryside of northwest Missouri, Holy Archangel Michael Skete is a convenient drive from numerous cities across Midwestern America, and already has established strong relationships with parishes and monasteries in several Orthodox jurisdictions in the region. So, “slowly, slowly” things are growing! For regular updates, see our Featured Posts. We continue to look for those who would like to join us in prayer, farming, woodworking, herbal remedies, and to volunteer in helping to build the monastery! Our prayer is that by visiting this website, you can catch a glimpse of a new beginning. Perhaps what you will take away is simply to do your part “not to be overcome by evil, but to overcome evil with good” (St. Paul to the Romans 12:21). Peace to you and yours. The Superior, Hieromonk Alexii, has set the tone for this “new beginning” through special emphasis on life in harmony with nature, and in active ways of reconciling all things in Christ, such as through participation in the annual St Moses the Black Conference. Explore the Skete website for more info, and consider purchasing Fr Alexii’s book, Reflections on Nature in These Times. 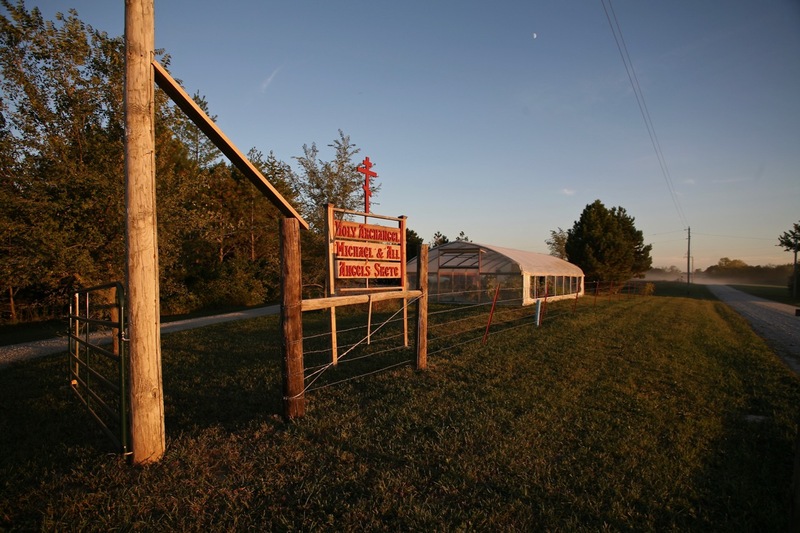 We’re honored that you’ve visited the website for Holy Archangel Michael and All Angels Skete located in Weatherby, Missouri! Take your time to discover beauty, goodness, and truth. We believe that these trails ultimately will lead you to the most wonderful of human experiences: inner freedom! Surrounded by the beauty of nature, the music of the trees, the songs of the birds, and the presence of our Creator in nature, our souls have a chance to catch their breath. Scroll down for a photo gallery from my blessed visit at this haven of peace and inner healing. The central house, housing refectory, kitchen, office and library. One of the small skete dwellings. The vineyard will enable the monks to produce altar wine. A special icon: ‘Rachel weeping for her children’. Read more about the vineyard… and about the visit of the Monarch Butterflies! The coffee stand, with photos of a beloved ascetic at right. Fragment of Gospel Book cover from St Herman Monastery, Platina; recovered from the fire which destroyed the first chapel, following Fr Seraphim Rose’s repose in 1982. This Gospel cover was originally from Optina Monastery in Russia! The icon is of Elder Ambrose of Optina. The brotherhood pouring a cement foundation for the new water cistern.